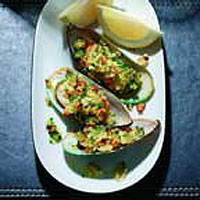 Mussels prepared this way are a treat and not too much of a fiddle to do. The butter and crumb stuffing will make a few go a long way, because you can mop up the juices with crusty white bread. Preheat the grill to high. Put 1 tsp of the butter mixture on to each mussel. Arrange on ovenproof plates - individual ones are best - and grill until the breadcrumbs are singed and the butter is bubbling. Serve straight away.